Watching the 2 hour and 10 minute film “Tomorrowland’ I was amazed, amused, bored and puzzled with the negatives running about even with the negatives which also seems to be the theme of the movie and people‘s choices. The screenplay by Brad Bird, who also directed, and Damon Lindelof have quite a few funny lines but a story that is all over the place and actually stops to explain what has happened and what will happen. The director’s vision of the future, with photography by Claudio Miranda and production design by Scott Chambliss, is amazing with multi level swimming pools, a world of transportation that doesn’t need roads and glass buildings and homes in various shapes and sizes. Looking at Tomorrowland from a distance it looks like Oz from the poppy fields only here over wheat fields but at the same time can look like the Disney company logo. Under the amazing part is Britt Robertson, playing Casey Newton who aside from looking and sounding very much like Jennifer Lawrence, makes the same impression as an actress and personality. Raffey Cassidy, in a very limiting role, does the best she can while Hugh Laurie, as a prize winning inventor, makes things rough for young Frank, played by Thomas Robinson and then the adult Frank played by George Clooney. Robinson does a good job but part of my puzzlement is why Clooney decided to be unshaven during the whole movie--hey this is a Disney film!--unless he thinks this is what all older curmudgeons looks like but still his natural charm comes through. Tim McGraw as Newton’s father doesn’t have much to do but is a presence whenever on the screen. Another puzzlement is why 10 minutes are wasted on a scene with Michael key and Kathryn Hahn, though they do a good job they don’t add anything to the screenplay being handled by other actors getting the same message across. There are some dazzling special effects in the film and the Eiffel Tower scene is a standout. 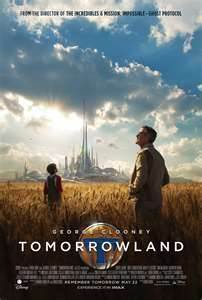 “Tomorrowland” is a feel good ending Disney film but can seem like a long time getting to the end. I have not seen Britt Robertson in her previous movie roles though looking up her credits I was surprised to see that she in in the television series “Under The Dome” which I have seen but don’t recall her part, so I would recommend seeing her in this movie. Full disclosure, and you will understand if you see this movie, I worked as a server in the Gas Pavilion at the World’s Fair in New York in 1964 and 1965.